In Argentina, heavy rain maintained adequate moisture for corn and soybean crops’ growth. Nevertheless, in some farms greater sanitary measures were required at the time of milking because of the muddy soil, and some roads were impassable especially in the rural area. On December 17, the government launched its first dairy futures market for raw milk to be used as a tool to minimize the economic risk generated by price volatility. Milk butterfat and protein component levels continue falling, while butterfat market is steadily firming as demands from ice cream and frozen desserts manufacturers and butter churners become seasonally stronger. The interest for other dairy products such as Mozzarella cheese is stable. After some unseasonal heat and dryness, the climate conditions were generally fair in Brazil for the development of summer crops such as soy and corn. Cumulative 2018 milk production is below 2017, mainly due to the mid-year trucker strike. Milk production is at the peak of the season and is expected to continue to grow throughout 2019. SMP export price increased slightly in South America. At this point, condensed skim milk volumes are becoming more available for drying. Nevertheless, SMP production is irregular as most balancing plant managers focus on WMP production. Export prices for WMP adjusted slightly down, in contrast with recent WMP upward pricing trends at the GDT. The top price of the range is mirroring sluggish trading activity within the Mercosur bloc, mainly from Argentina and Uruguay to Brazil. WMP inventories are steady to slightly higher. 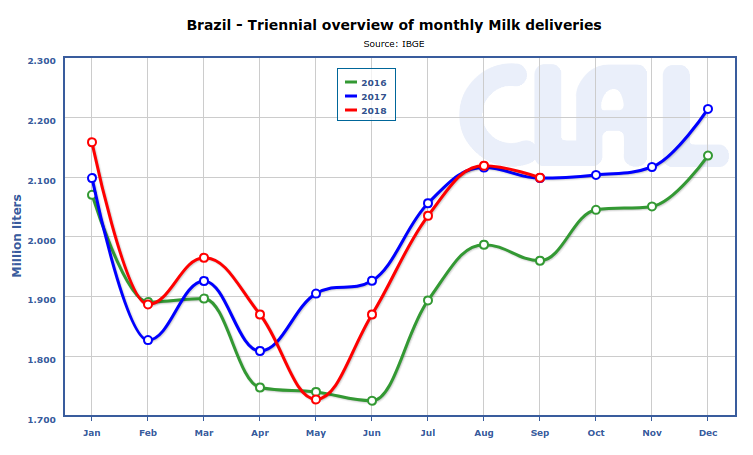 CLAL.it – Cumulative 2018 milk production in Brazil is below 2017, mainly due to the mid-year trucker strike.